Usage: Blend 4-5 tablespoons per 1 cup mayonnaise and 1 cup sour cream. Refrigerate at least 1 hour to intensify flavor. 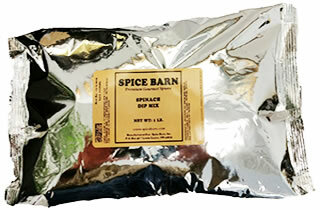 Ingredients: Dehydrated Onion and Garlic, Spinach Flakes, Salt, Sugar, Paprika, Spices, and Extractives of Paprika.